An entry-level mountain bike that belies its stature, the Nucleus is the model that all other Vitus rides take their attitude and high-standards from. MBR award-winning for its performance and price for three years running, its an ideal MTB starter-steed. The Nucleus 275 VR Mountain Bike benefits from a quality construction which features low, long and slack geometry for making the most of climbs, descents and sprints through varied trails and terrains. Kitted out with hard-working components, it lets you ride with confidence and aggression, no matter what your route throws at you. The 120mm travel SunTour front forks absorb every impact on your run as you are pushed on by a superb Shimano Altus 2x9 drivetrain. Keeping you in control are powerful Tektro hydraulic brakes and the frame is designed to feature dropper post routing for future upgrade potential. 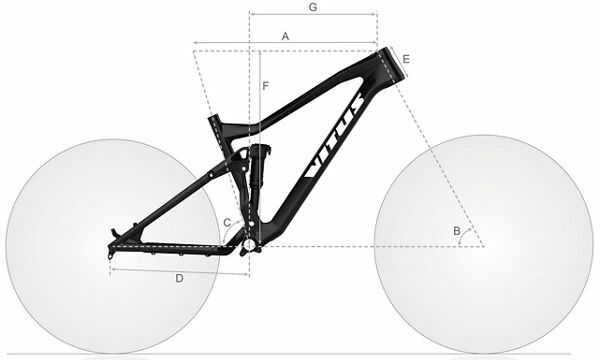 An excellent addition to the foundation range of Vitus' MTB offerings, this is a hardtail that will take your riding to new heights. Vitus Nucleus 275 VR Mountain Bike (2019) is rated 5.0 out of 5 by 2. Rated 5 out of 5 by Rob1924 from Can't beat it for the money! Fantastic bike. It has everything you need from a hardtail mtb, except maybe a dropper post but that can be bought at a later date. The blue 'Vitus' logo is darker in real life and looks better than I thought it would. Shifting of the rear derailleur is faultless but the front can take some persuasion. It actually has an 11-36 cassette (not 11-32 as stated) which is nice. It didn't come with tubeless valves as stated in the description but Wiggle sent some out to me free of charge so no worries. This bike comes with standard basic flat pedals. I am 5&quot;11 - would the medium or large bike be better suited to me as my size fits both categories? Ideally with trail MTB bikes, we would always advise that if you are between two sizes, then to opt for the smaller of the two. This will make the bike more maneuverable in the tight twisty stuff. However Your inside leg measurement will play a part in which size you go for. Is the fork air or coil? No, this would not be compatible with 29&quot; wheels. What length cracks does the small size come with? The small size frame will usually be supplied with a 170mm crank arm. I would recommend you the XL size bike. Please find the size chart below. What kit do I need to buy to make this bike tubeless? I have just bought this bike and want to make it tubelrss, what kit do I need to buy? The wheelset supplied is tubeless ready. You'll just need to use the tubeless valves (supplied), tubeless tyres and sealant. For further assistance feel free to speak with us on our live chat service. Do the SR Suntour XCR32-Air RLR 15QLC32 Suspension Fork 27.5+ 120mm that come with this bike have have a lockout on the fork? We can confirm these do have a lock out We hope this helps! is it a tapered headset and fork? Yes this bike does come with a tapered headset and fork.